Crystal Rose Demientieff Worl is Tlingit Athabascan from Raven moiety, Sockeye Clan, from the Raven House. She is a child of a Thunderbird and from the Chilkat region in Southeast Alaska. From her mother’s side, she is Deg Hit’an Athabascan from Fairbanks Alaska. Raised between Fairbanks and Juneau, she was introduced at a young age to her traditional arts, practices, and storytelling. In 2013 Crystal earned a Bachelor’s of Fine Art in Jewelry Metals and an Associate’s of Fine Art in Moving Images from the Institute of American Indian Arts. Crystal experiments with kiln-cast glass, printmaking, painting, and silversmithing. She recently began working with fish skin, seal gut-skin, and furs. Crystal studies traditional Tlingit formline design and Athabascan beadwork patterns. She experiments applying her designs within mixed media and performance, including aerial dancing. She practices the recreation and modernization of her Clan’s stories and Raven stories from home. Her work explores the relationships and bonds between her people, the land, and the animals. 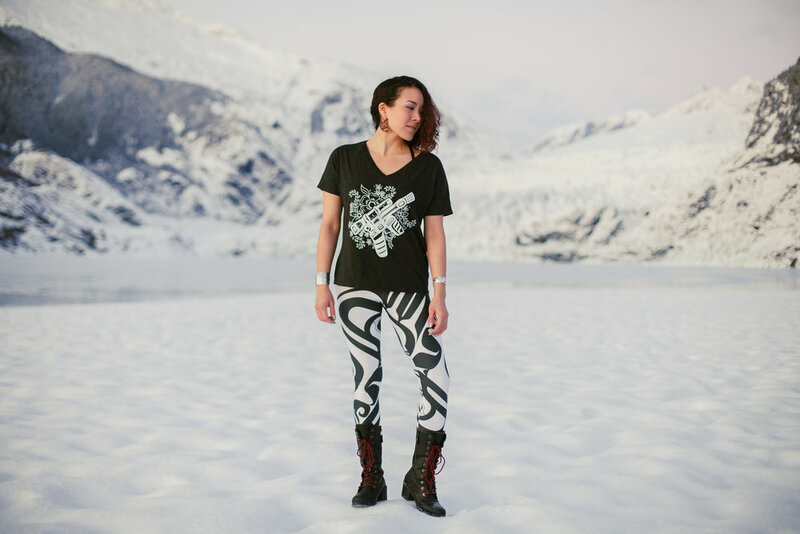 Today Crystal lives in Juneau, Alaska working as a co-owner of Trickster Company with her brother Rico Worl. Trickster Company promotes innovative indigenous design focused on the Northwest Coast art and exploration of themes and issues in Native culture. I am Tlingit and Athabascan from Juneau and Fairbanks, Alaska. My mother Beverly Demientieff is Deg Hit’an Athabascan from Holy Cross, Alaska. My father Rodney Worl is Tlingit from the Thunderbird Clan. I am Raven moiety, Lukaahadi Sockeye Clan, from the Raven House from the Chilkat region of Southeast Alaska. I am a storyteller, a dancer, and an artist. As a visual artist I create mixed media work with jewelry metals, kiln cast glass, printmaking, and painting. Many of my materials and dyes are harvested from Alaska, such as blueberries, fireweed, and wood. Recently I have been studying how to work with animal hides, skins, intestine, and furs. The stories I share in my art are about Raven. The forms I focus on are based on traditional Tlingit design that are often intertwined with Athabascan beadwork design. I practice the recreation and modernization of Tlingit and Athabascan designs. The purpose of my art is to bring attention to cultural growth and discovery. My creative process is a means to bridge my experiences between two worlds, the traditional worlds of Tlingit, and the modern world. I create art to share my ancestral knowledge of creation and life and pass on old values to the new generations.